Set in its original Tudor setting, against the beautiful backdrop of Oxford Castle, this promises to be a show you don’t want to miss this summer. Baptista faces a problem. Several men in town want to marry his daughter, Bianca. However, that leaves him with his other daughter, Kate. A monstrous shrew of a woman that scares off everyone she comes into contact with. So, Baptista comes up with a plan. Bianca may not marry until her sister does. This is where Petruchio comes in – a man hired by Bianca’s many suitors to make a wife of Kate. 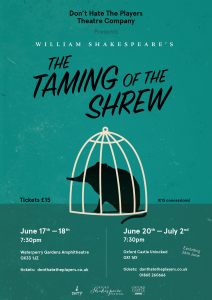 Join Don’t Hate the Players Theatre Company for their third Shakespeare production and see if Petruchio can tame this shrew, or if it’ll be him being tamed.